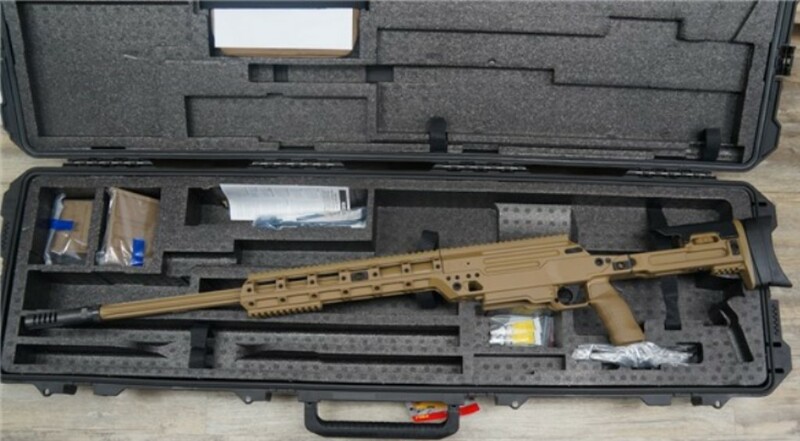 FN BALLISTA 338LAPUA FDE 26inch Bolt Action Rifle, with Fluted /barrel. ON SALE NOW $6800 shipped! Modern, modular and multi-caliber, the Ballista™ represents the future of precision rifle systems. Designed to deliver surgically precise fire, the rifle can be configured in less than two minutes to any of three available chamberings (.338 Lapua Mag., .300 Win. Mag., and .308 Win.). Featuring repeatable accuracy with all chamberings, the Ballista™ employs a high strength, vibration-isolated aluminum alloy receiver with a top mounted MIL-STD 1913 rail. In addition, the rifle features multiple rail segments for the addition of accessories. Fluted barrels measure 26-inches, and the bores have polygonal rifling with a right-hand, constant twist rate. A fully adjustable trigger (for single or two-stage release between 3 and 5 pounds) and adaptable, ambidextrous, folding stock allow the shooter to configure the rifle for enhanced performance. For those who want the future of precision rifle performance today, look no further than the Ballista™ multi-caliber system. Accessory conversion kits available in: .300 Win. Mag. and .308 Win. Trigger system is fully adjustable for single or two-stage release between 3 and 5 lbs. OUR SALE PRICE $6800 shipped!